As memorable as “Shoo-doot-n shooby-doo” or “Awopbopaloobopalopbamboom” and every bit as meaningful, “Ba-bada-baaa ba-bada-baaa!” is the war cry of Canadian rock’n’roll. Or, it was for a generation of us, and recent events have shown just how important that simple chorus was. 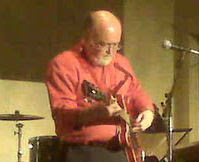 Roly Greenway and Kelly Jay Fordham were inducted into the 2011 Canadian Songwriters Hall of Fame for their classic one chord tune “Oh What a Feeling”. And this weekend, their band Crowbar received a Lifetime Achievement Award at the Hamilton Music Awards. The award was presented at a long ceremony on Sunday night, but on Saturday night, Crowbar rocked the joint at Mohawk College’s McIntyre Performing Arts Centre. Crowbar was the first band to benefit from Pierre Juneau’s new Canadian Content legislation (a law designating the implementation of 30% mandatory Canadian content by all radio stations) in 1970. Because of this legislation, everyone in Canada could finally hear on the radio just how great our own music was. Their success, mixed with the fact that Margaret Trudeau was a fan, led to photo-ops with Prime Minister Pierre Trudeau. They achieved huge success in Canada, but because people south of the border thought “Oh What a Feeling” was about some illicit substance or other, they received little airplay in the USA. On Saturday night, they made enough noise to wake our neighbours from their slumber, and keep the rest of us dancing for another 40 years. The ticket said 8pm but the show started late as the technical awards ran overtime, but at 8:30 local bluesman Steve Strongman kicked things into gear with a powerful half-hour set of his own. Supported by Paul Inston on bass, Dave King on drums and keyboardist Jesse O’Brien, Strongman worked hard to get the scattered crowd excited. By the end of his set the auditorium had filled up, and so had the expectation. Sorry Steve, but as good as your band was… this was Crowbar’s crowd. The blues continued with a version of “Corrina, Corrina” sung by drummer Bernardi in place of King Biscuit Boy who sang it on the record. 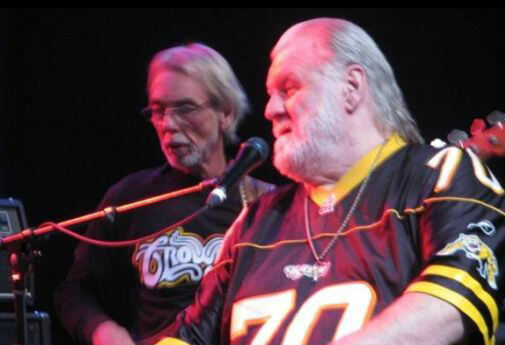 Old rock’n’roll was also paid tribute with Crowbar’s rendition of Johnnie & Joe’s 1957 hit “Over the Mountain”. Kelly Jay introduced “Ain’t No Cane on the Brazos” as “a 300-year-old gospel song”. Well…not quite, but it is a traditional prison work song of the American south, previously recorded by Leadbelly, Odetta, and even The Band. You can watch Rick Danko and Janis Joplin sing a sloppy version of it in the film Festival Express. 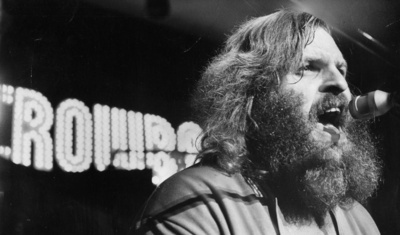 Crowbar had previously recorded it during their live album in 1971. An example of how big they were in 1971: the concert that was recorded for Larger Than Life (and Live’r Than You’ve Ever Been) was broadcast on the radio as it happened, and we stayed home to listen! The band that played at Massey Hall that night in September 40 years ago was essentially the same band on the stage this weekend, except keyboardist Josef Chirowski has been replaced by Ray Harrison (back in ’78). Roly Greenway is still the bassist, and perhaps the most active member of the group. For Saturday's show they added three horn players from Hamilton’s 905 Band who provided admirable support and filled one or two solo spots. Kelly Jay’s bulk has slowed him down, along with his age. He sported a Ti-Cat jersey with the number 70 representing his age. The last three concerts I’ve attended have been by aging musicians. 63 year old Arlo Guthrie played a solo show celebrating the 100th anniversary of his father Woody’s birth. His age added a gravitas to his tales of life with his father. He hadn’t lost a step when it came to memory or guitar playing. Judy Collins turned 73 this year, and showed her age in a recent concert, forgetting a verse of “Chelsea Morning” and being a tad pitchy in the upper register. Her stories tended to wander. The last BB King show I saw found him playing only one verse and a chorus of many tunes and depending on his backing musicians far more than he used to. I well remember The Beatles claiming that no one would be interested in a 70-year-old Beatle but Paul McCartney continues to tour to rave reviews. Bob Dylan tours constantly but his new found (or should I say lost) voice is the target of critical sniping everywhere he goes. Some friends attended Gordon Lightfoot’s Massey Hall concert last the same night I saw Crowbar and they reported that he was “wonderful”. What is the right retirement age for musicians? My wife told me that she thought Crowbar was sad. I know she doesn’t want to see BB King again, preferring to remember him as he was, not as he is now. For me, Crowbar was exactly as I expected, ragged, funny, loose as a goose. They’ve always been that way. In the basement of the Jewish Community Centre back in 1969, on stage at Massey Hall during that live broadcast in 1971, on a bootlegged tape from the Whiskey A-Go-Go, they were a rock’n’roll band and they liked to party. Party they did on Saturday night. It was a blast from the past as they brought up friends and neighbours to sing along with their anthemic hit, and not a soul in the crowd didn’t join in! Oh what a feelin', what a rush! Well you we got the feelin', makes you come alive. We're gonna boogie woogie, we're gonna rock and roll, we're gonna jive. Gonna fill your head with music, satisfy your soul. Come in to my house, you're all invited. Hey, hey I feel alright. Unh, unh, unh, unh! I always wondered what became of Crowbar, I loved their records- still listen to them- so it's good to read that they performed as recently as last November. Also made 2 (that I know of) great records with King Biscuit Boy. I'm located in Seattle and I remember a Television Broadcast on CBUT out of Vancouver about 1971. The film was about 1/2 hour concert of Crowbar playing at (I think) one of Pierre Trudeau's relection parties. I thought it may have been at Maple Leaf Gardens. A Giant Cake was moved on to the stage and the band with Kelly Jay, Rheal Lanthier, Josef Chirowski, Sonny Bernardi, Roly Greenway and John Gibbard all came out of the the top of the cake and started rockin' the stage. John and Rheal got up on Kellys shoulders and played away as he walked around the stage. I'll never forget the film and have been looking for someone who may have recorded the TV footage. I remember a broadcast on CBUT TV out of Vancouver of a Crowbar Concert that I think was at Maple Leaf Gardens about 1971 and was a celebration of Pierre Trudeau's re-election. A giant Cake was up on the stage and when Crowbar was introduced, one by one they came out the top of the cake and started rockin" out. At one point Rheal Lanthier and John Gibbard climbed up on Kellly's shoulders and played away as he struted around the stage during one of the songs. 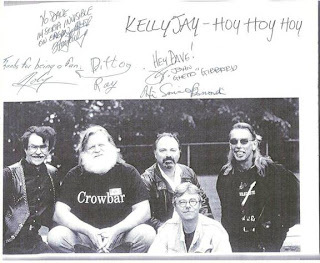 The film was only about 1/2 hour long, but depicted Crowbar as this high energy group that should have been huge outside of Canada. I'll never forget this show and have been looking for anyone who may have a recording of that broadcast. Contact me direct at oldereck@msn.com.